Poland, partitioned out of existence in 1795, regained its independence as a republic at the end of the First World War. Sir Horace Rumbold was appointed in 1919 as the first British minister since Colonel Gardiner departed Warsaw in 1795. Rumbold established his legation in an imposing palace at 18/20 Nowy Swiat, on the corner with Smolna Street, rented from Count Branicki. Ten years later, when the mission was raised to the status of embassy in 1929, Count Branicki told the ambassador that he did not wish to renew the lease beyond 1935. He subsequently put this date back to 1942, before which the Polish government and the embassy moved to London for the duration of the war. The Branicki palace itself was completely destroyed by fire during the Warsaw Uprising of autumn 1944. 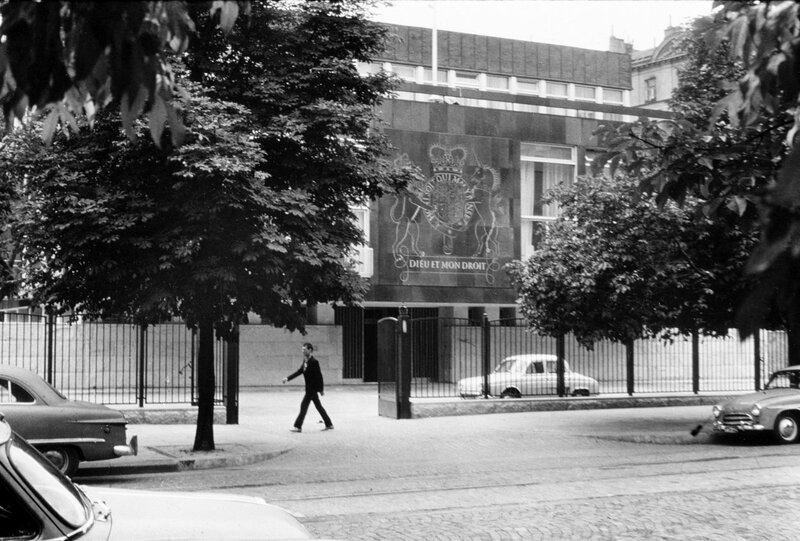 In the months before the embassy left Warsaw, London had agreed to the acquisition of a new site on which to build a whole new embassy. A contract was accordingly signed in April 1939 with Counts Stefan Tarnowski and Benedict Tyszkiewicz for the purchase of a 4,605 square metres site for £38,000 at the corner of Aleje Na Skarpie with Rue Kasztanowa. This site was transferred by decree to the city authorities in October 1945 to become part of an adjoining public park, leaving the Polish authorities with a responsibility for providing the British government with a replacement site in due course. 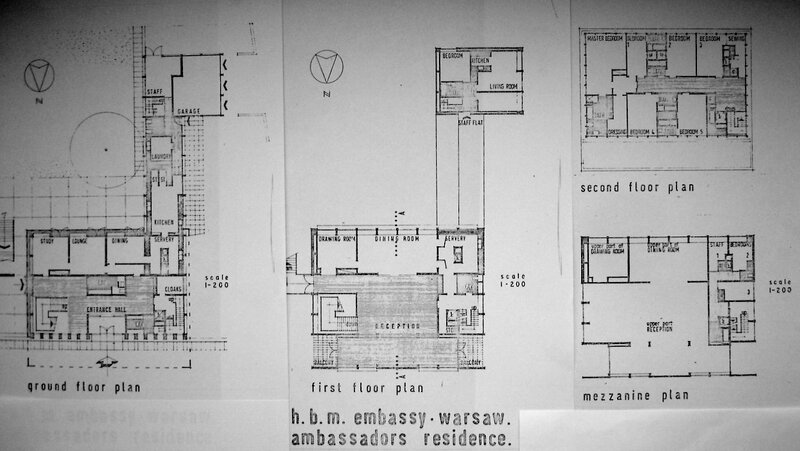 When the embassy returned to Warsaw after the war it took temporary quarters on the first floor of the Hotel Polonia, at Al Jerozolimskie 39 until it could find proper accommodation. The choice for permanent offices fell on the fine 19th century palace at 1 Aleje Roz, which was leased in 1945. It was built in the mid-1870s for Anton Nagorny to plans by Jozef Huss. From 1898 to 1932 it belonged to the Marchioness Eliza Wielopolska, who largely rebuilt it in 1904. All of the embassy offices fitted into the Aleje Roz building except the Information Section which was outhoused, with a reading room and bookshop, in Marszalkowska Street. By the mid-1960s, Aleje Roz was becoming over-crowded and run-down and ideas of acquiring a new site and building offices came to the fore. The site selected, of about one hectare, was at the corner of Szwolezerow and Mysliewicka Streets, in parkland not far from the city centre and in the right diplomatic area. 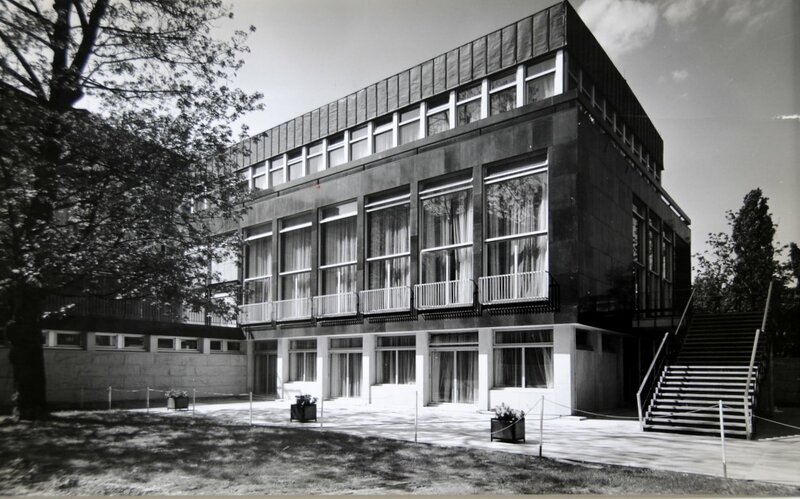 Norman Isham, a senior architect in the Ministry of Public Building and Works, designed an in-house scheme for offices, four detached family houses, fourteen town houses, four flats, an amenity centre including a covered swimming pool, and all ancillaries. Planning consent was granted in November 1971, and a 99-year lease was agreed in 1972 at a fixed rent of about $20,000 per annum. Progress was halted in1975 by an absurd demand by the Polish authorities for an immediate lumpsum payment in lieu of rents due over the entire term: it took four years of argument for them to revoke this demand. The development scheme eventually went to tender in 1981 and prices, reflecting political instability, came back impossibly high at over £15 million. The imposition of martial law in December 1981 killed off the scheme. In what can only be called a collective error of judgement in the first year of the diplomatic estate being managed by the Foreign Office, the site was sold in 1984 and a major renovation of Aleje Roz instituted instead. To lessen the pressures on Aleje Roz, a house that was formerly occupied by the commercial counsellor, 14 Wawelska, was converted in 1986 into the consulate, where it remained until 1993 when the visa regime was abolished and the consulate and commercial section moved to new offices on the third floor of the Warsaw Corporate Centre, opposite the Marriott Hotel. The major refurbishment of Aleje Roz took place in 1987-90, with Ian Rennie the resident architect and Higgs and Hill the contractor: only cleared UK labour was employed on the interior works. The detail of the phased programme proved far too complex and the project placed enormous strains on the morale and operations of the Post. Nevertheless, as a result of this refurbishment, and of an external face-lift in 1995, the Aleje Roz palace, and particularly its ballroom (used for events and conferences) looked good and worked well. 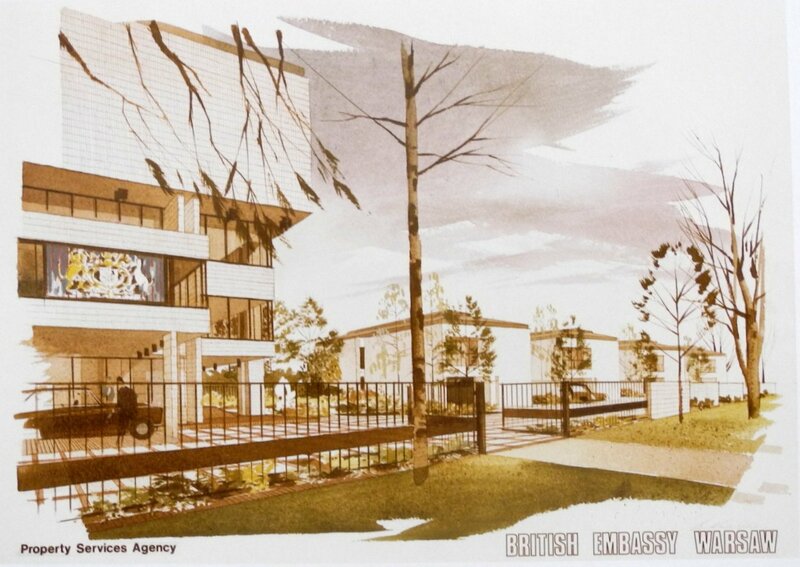 Early-1970s proposal for entire new embassy: Offices at left; garage and amenities centre behind; terrace of staff townhouses at rear; senior staff houses in foreground. 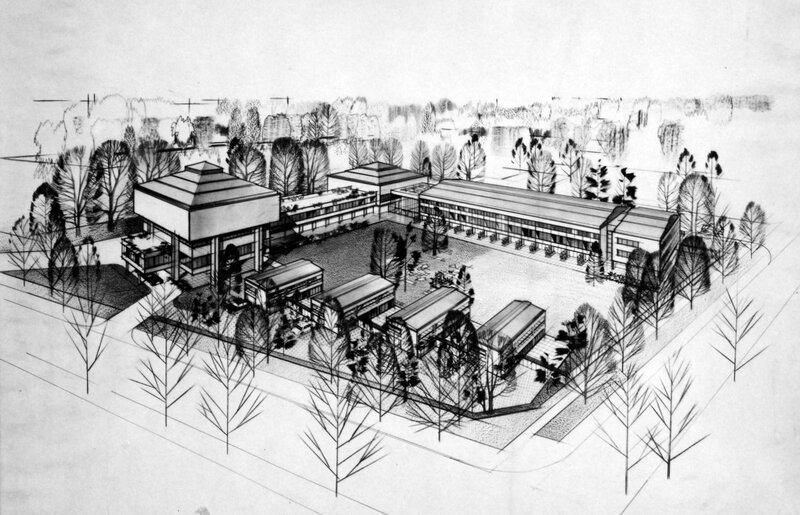 Sketch view of proposed offices and detached houses, 1972. 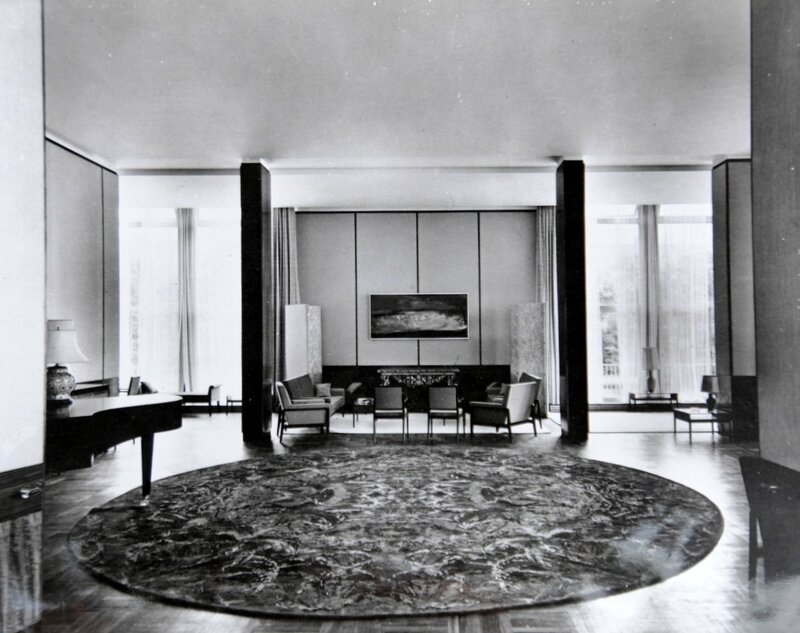 The first post-Second World War residence was a modest suburban house at 10 Narbutta. By the mid-1950s, something larger and better was required, and the British government asked the Polish authorities to come up with a site, as promised, in exchange for the Aleje Na Skarpie site. This request bore fruit in 1960, when a site of exactly the same area (of 4,605 square metres) was granted at 5 Bagatela, rent-free for 80 years, with an option to extend for 20 more years. The new house on this site was designed in-house by the Ministry of Public Buildings and Works by John Kaye, senior architect, advised by a succession of local architects, Prof Szmidt at first, succeeded by his nominee Prof Baumuller, and then by a Mr Hoffman. William Bryant, the Ministry’s superintending architect, achieved planning approval in July 1961. After a visit to Warsaw to explore the availability of building firms, he recorded that the head of the Polish State Building Organisation (CEKOP) had ‘mentioned three firms but recommended Enterprise for Industrial Construction No 1. He confirmed that it would be a waste of time to ask for competitive tenders as everything depended on the firm appointed to have the necessary suitable staff available at the time we wish to start building.’ Treasury approval was sought and granted in March 1962 for £155,000. Construction was duly completed by the Polish state company, and the final cost was £208,000. This house was the only British diplomatic building to be built behind the Iron Curtain throughout the Cold War. The ambassador, George Clutton, moved in on 6 July 1964. The Narbutta house was then given up. The house, rectilinear and faced with mottled grey-black Polish granite, is built around large reception and dining areas on the first floor, panelled with English walnut. The garden was one of the best features of the house. Clutton found much to criticise: the biggest problem turned out to be the solar gain in the dining room. At the instigation of what London officials dubbed the Taste Committee (formally, the Advisory Committee on Decoration and Furnishing of new embassies) Robin Day and Robert Heritage were commissioned to design some of the furniture, and David Mellor to design and make a large set of silverware (that was intended for adoption also at other new residences – but was never liked enough to be repeated). On the other hand, the embassy housed two of the British diplomatic estate’s most important collections: the Zamoyski furniture and the Beresford-Hope silver. Their detail and history can be found in Room for Diplomacy, pp. 368-370. 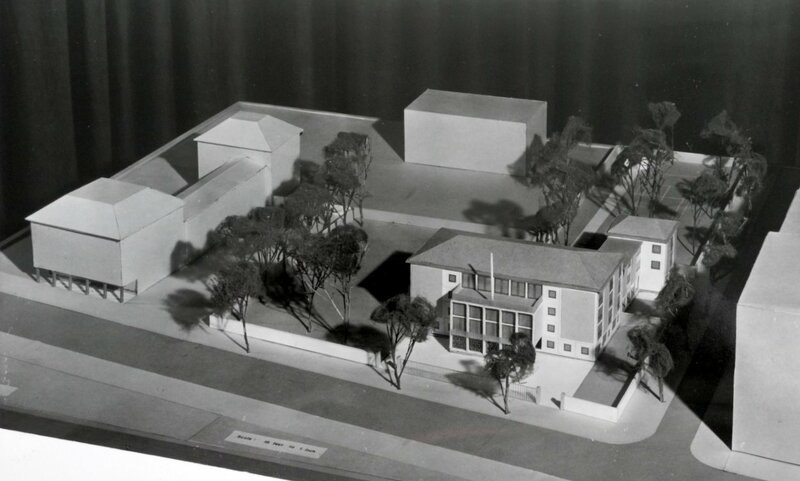 Early sketch model of proposed residence, 1960. 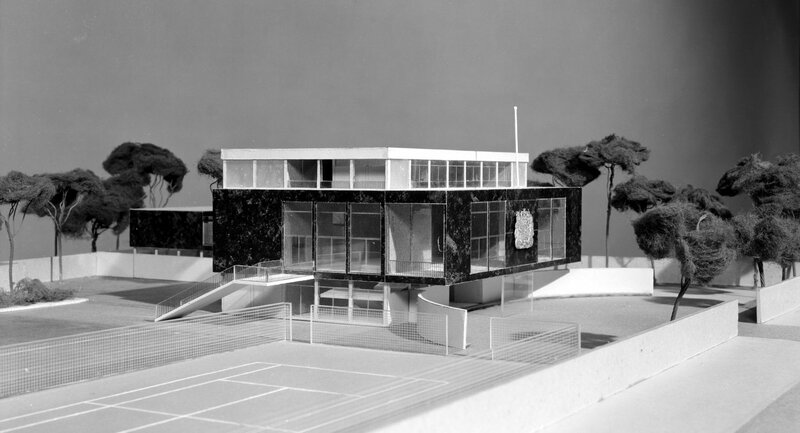 Later sketch model for proposed residence, 1960. Residence from the street, 1964. 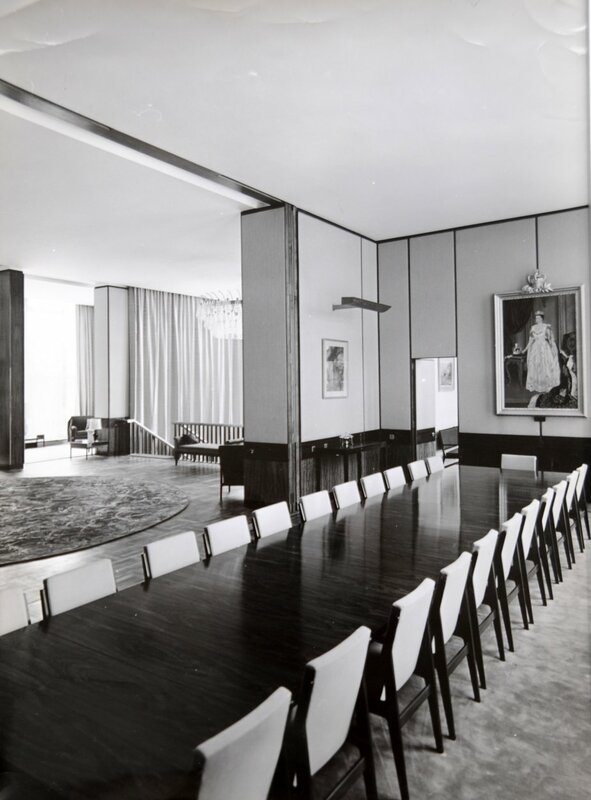 Part of reception room, 1964. Residence floor plans, c. 1970. With the dramatic political changes that followed the end of the Cold War, the property at Aleje Roz became due for restitution to its former owners by, at the latest, April 2008. The strategy in 2002 was to hold an architectural design competition for a combined office and residence development on the 5 Bagatela site of the existing residence (which would have to be demolished). It was hoped that the construction of the winning entry could be completed in 2006. Six architectural practices were invited to propose outline designs, from which a panel selected the design by Tony Fretton as the winner in May 2003. 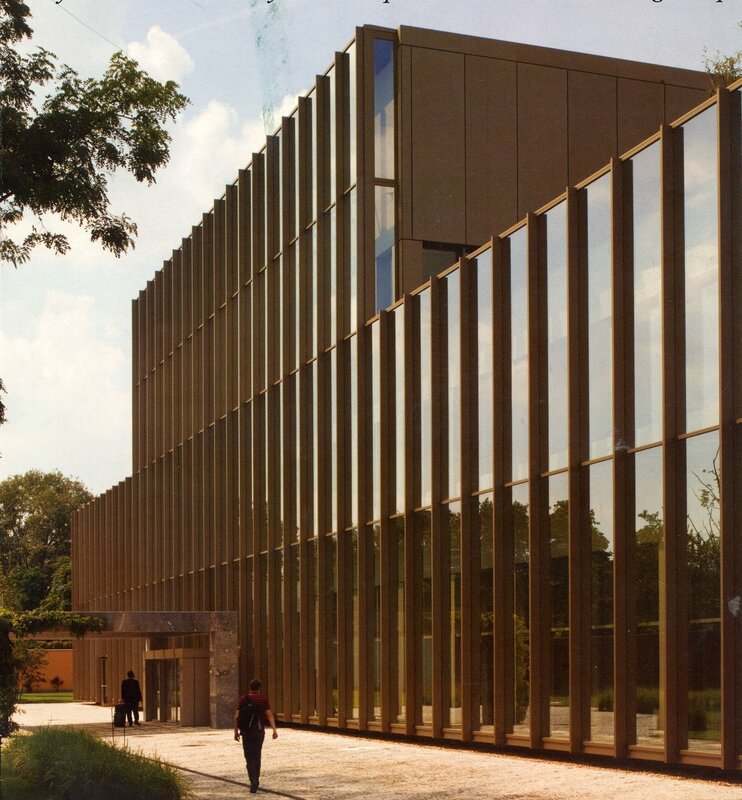 Fretton’s first scheme foundered over the next few years, not least as a result of more onerous security demands, and attention turned to a different site, on Kawalerii, for which Fretton designed a new offices-only scheme. This began construction on site in April 2008 with the British firm, Mace, responsible for detail design and construction. The building was completed in October 2009.